Baby Boy 18-24 Month Gymboree Toucan Print Pocket Tee Shirt, Green Twill Shorts & Socks. Condition is New with tags. Shipped with USPS First Class Package. Baby Boy 18-24 Month Gymboree Blue T-Shirt & Striped Shortall Overalls Set. Condition is New with tags. Shipped with USPS First Class Package. Gymboree boy's two piece outfit, sweatshirt and jogger pants, size 18-24 mos. LONG SLEEVE TOP HAS HIPPO AND FROG, "DYNAMIC DUO" ON FRONT. 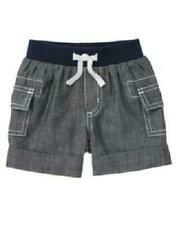 MATCHING COTTON TWIL PULL ON PANTS HAVE FULL ELASTIC WAISTBAND. White bodysuit top with faux leather appliqué with embroidery and the words "Daddy's Draft Pick" on front. Matching shorts are blue with a football embroidered on one leg at hem and have elastic waist for easy pull on style. PULL ON NAVY BLUE PANTS HAVE A FULL ELASTIC WAISTBAND WITH TWO BACK AND FRONT POCKETS. SIZE 18-24 MONTHS. Brand new with the tags on it. Never worn. To small for my son. Red and white shirt with blue pirate. Tank top to. With red shorts with a white strings on the front. Retails at 26 bucks! LONG SLEEVE TOP WITH THREE FRONT BUTTONS. PULL ON BOTTOMS. BOTH ARE LIGHTWEIGHT COTTON KNIT WITH BATS ALL OVER. LONG SLEEVE TOP HAS EMBROIDERED POLAR BEAR ON FRONT. MATCHING PULL ON FLANNEL LINED PANTS HAVE FULL ELASTIC WAISTBAND, TWO FRONT AND TWO BACK POCKETS. This listing is for all items shown. All items are size 18-24 Months. All items are NWT. From the retail store. Smoke free and pet free home. Gymboree NEW/NWT Girls 2 pc outfit/lot embroidered floral aline top in size 18-24 months with matching navy blue biker shorts size 18-24 months and will mix and match anything. Gymboree Baby/Toddler Boy Sizing Info navy athletic pants with wide elastic waistband, gentle elastic at bottom, 4 pockets, lined in softest tshirt type materials, material is 100% cotton, inseam ~12". Navy speckled knit sweater done in 100% cotton, long sleeves, neck, end of sleeves, bottom of pull-on sweater in solid navy blue, features applique/embroidered football front, left front at neckline 3 button open for easy on/off. Vest -12-24 Months. Size: Pants 18-24 Monts. 100% cotton, Lining - 100% polyester. I am an honest person, loving wife, mom and nana trying to make a few extra bucks here and there. 100% cotton unless stated otherwise in the "What's Included" section below. Excellent Gift Set! khaki corduroy pants, faux fly with snap at waist, waist is flat front then wide elastic around, 4 pocket, material is 100% cotton, inseam ~11.5". Gymboree boy's one piece romper, navy blue with stripes, size 18-24 mos.